As soon as the corn was all cut, "stooked" and dry, it was time to bring the harvest home on the horse-drawn cart for stacking in the stackyard. A structure of corn sheaves would be built around a narrow "wigwam" framework of timber poles in order to allow ventilation to the core of the corn stack (this hollow centre would soon become a haven for a variety of animal life - including young children). Below the stack would be a circular foundation of large stones which formed a dry base to protect the corn from becoming damp. These stone circles are still frequently visible today as a lasting testimony to farming practices of the past. One of the main events on the farming calendar in Strathnairn was the "threshing". Usually around October or November the Strath farmers would take it in turn to have their corn threshed. On each occasion, all the surrounding farmers, their farm workers and neighbours would come together to lend a hand "at the mill" where the corn in the carefully-built stacks would be separated into grain, straw and chaff. These were social events on a grand scale and the day's work would be hard but the company and "crack" would make it an enjoyable day away from the normal routine. The ladies would be extremely busy cooking for the crowd and the children would be having the time of their lives - usually hunting down escaping rodents! 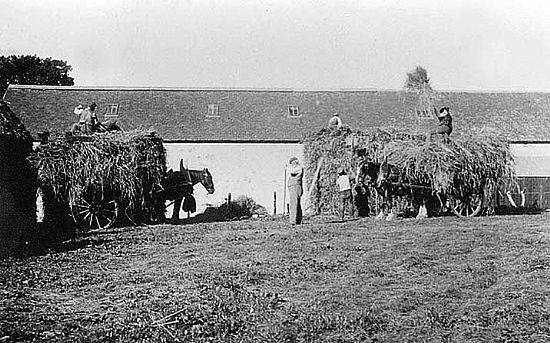 The practice of communal threshing continued until the 1970's when it eventually died out. Farming methods changed as silage-making began to take over from traditional corn harvesting. The unpredictable weather up in the Strathnairn hills was all too frequently responsible for lost harvests and the grave consequences this brought to the farming economy. Silage making, on the other hand, was a much less weather-dependent means of harvesting and - while it was a safer means of procuring winter feed for livestock - it brought about the sad demise of the "threshing" and a social occasion so fondly remembered by older Strathnairners. This photograph shows some corn stacks under construction. Most likely this photograph would have been take at the Dunmaglass Mains steading.